Sometimes the question of whether or not we should use unleavened bread in communion arises. Our Session addressed the question recently. Here are some of the common reasons given for using unleavened bread in communion. “Unleavened” bread is mentioned 62 times, not exclusively in connection with Passover aka the Feast of Unleavened Bread. No leavened bread was to be used in the Passover. Jesus and the disciples were celebrating the Passover, using unleavened bread, when the Lord’s Supper was instituted. Tradition may have overridden God’s Word in permitting leavened bread to be used. Scripture never says to use leavened bread. No teacher or pastor promotes partaking of leavened bread. Leaven has a negative symbolical overtone. Since it seems to symbolize sin how can we use it to celebrate the Lord’s Table. Leavened bread should not be seen as a symbol of sin. It was permitted to be eaten 51 weeks a year. It is okay for us to sin 51 weeks a year? The bread of the Presence, set on the table in the Tabernacle (Ex. 25) is not said to be unleavened. If it was a symbol of sin, would such leavened bread be permitted to serve as the bread of the Presence? In Exodus 29, recounting the ordination of the priests, it is unclear if the bread mentioned in vv. 23 (one loaf of bread and one cake of bread made with oil, and one wafer out of the basket of unleavened bread that is before the Lord) is the same as that mentioned in vv. 2 (unleavened bread, unleavened cakes mixed with oil, and unleavened wafers smeared with oil). Both include bread, cakes and wafers. But vv. 2 indicates all of them are unleavened. In vv. 23 only the wafers are. Only bread, unqualified, is mentioned in vv. 32 & 34. This is clarified in Leviticus 8:26 which again mentions both. … 26 and out of the basket of unleavened bread that was before the Lord he took one unleavened loaf and one loaf of bread with oil and one wafer and placed them on the pieces of fat and on the right thigh. In Leviticus 7, thanksgiving offerings include unleavened bread, BUT peace offerings include leavened bread (vv. 13). In Leviticus 23:17 bread baked with leaven is used in during the Feast of Weeks. 17 You shall bring from your dwelling places two loaves of bread to be waved, made of two tenths of an ephah. They shall be of fine flour, and they shall be baked with leaven, as firstfruits to the Lord. In this passage, we see that leaven is used positively in describing the kingdom of heaven. While many of the uses of “leaven” are negative, the overall use is figurative to indicate how a little of the matter at hand spreads to permeate the whole of a body. This is how it is used; sometimes negatively and sometimes positively. Therefore, leaven itself is not to be seen as evil. Its presence would not necessarily make the bread “unclean” for the purposes of the Lord’s Table. We Celebrate the Lord’s Supper, not the Passover. 1 Corinthians 5:6-8 indicates that Christ has fulfilled the Passover for us. It was a type of Christ. The shadow of Passover has been fulfilled and abrogated as part of the ceremonial law which governed worship in the Old Testament. Paul’s use of leaven/unleavened in the context is figurative rather than literal: malice & wickedness vs. sincerity & truth. He speaks not of the bread used, but of our attitudes in the celebration of the Lord’s Supper (not Passover). In 1 Corinthians 10:14ff we see Paul using the general word for “bread”. The flight from idolatry is also the flight from syncretism. His focus is on our unity in Christ as depicted in the Lord’s Supper. In Luke 22:7 we see there is a word for “unleavened bread”. Paul could very well have used this in his letter to the Corinthians to clarify matters for these Gentile Christians. In 1 Corinthians 11:23ff the general word for “bread” is used again in reference to their celebration of the Supper. Paul does not clarify this for his largely Gentile audience. Paul may have implicitly intended them to use unleavened bread as in the Jewish festival. However, he has previously told them the Passover was fulfilled in Christ. Paul once again seems less concerned with the elements used than how they celebrated it (the point of the passage is corrupt worship in Corinth). WSC Q 96: What is the Lord’s Supper? A: The Lord’s Supper is a sacrament, wherein, by giving and receiving bread and wine, according to Christ’s appointment, his death is showed forth; and the worthy receivers are, not after a corporal and carnal manner, but by faith, made partakers of his body and blood, with all his benefits, to their spiritual nourishment, and growth in grace. WLC 168: What is the Lord’s Supper? 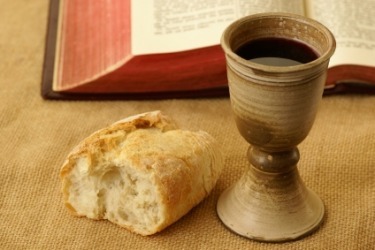 A: The Lord’s Supper is a sacrament of the New Testament, wherein, by giving and receiving bread and wine according to the appointment of Jesus Christ, his death is showed forth; and they that worthily communicate feed upon his body and blood, to their spiritual nourishment and growth in grace; have their union and communion with him confirmed; testify and renew their thankfulness, and engagement to God, and their mutual love and fellowship with each other, as members of the same mystical body. WLC Q. 169: How has Christ appointed bread and wine to be given and received in the sacrament of the Lord’s Supper? A: Christ has appointed the ministers of his Word, in the administration of this sacrament of the Lord’s Supper, to set apart the bread and wine from common use, by the word of institution, thanksgiving, and prayer; to take and break the bread, and to give both the bread and the wine to the communicants: who are, by the same appointment, to take and eat the bread, and to drink the wine, in thankful remembrance that the body of Christ was broken and given, and his blood shed, for them. “It is our conviction that when the Lord instituted the sacrament he used unleavened bread and fermented wine. … And with this evidence agrees the known practice of the ancient Church, in which unleavened bread and fermented wine were used. Since church history was mentioned we thought it pertinent to include the views of Martin Luther and John Calvin, two of the most influential Reformers. Their views are not authoritative, but rather helpful for us. One of Luther’s objections to the Roman doctrine of transubstantiation was that they no longer served bread and wine. Luther held to the view that we should use bread and wine in obedience to Christ’s institution of the Supper. In culture where bread and/or wine are available (like ours, but not some islands in the Pacific for instance) they should be used. We should not celebrate it with pizza (though it includes bread) and Coke. Luther did not specify that unleavened bread should be used. “Furthermore, Satan, to deprive the church of this inestimable treasure, has long since spread clouds, and afterward, to obscure this light, has raised quarrels and conflicts to estrange the minds of simple folk from a taste for this sacred food, and also has tried the same trick in our own day.” John Calvin, Institutes IV, XVII, 1. Calvin notes that the Supper sends us to the Cross, not to Passover except as much as Christ is the Lamb slain for us. The “thing signified” is of far greater importance for Calvin than the sign. As a result, he did not focus on the type of bread that is to be used. Another aspect of church history we should consider is the practice of the church. It is not authoritative, but illustrative. Both John Hammett and Robert Letham note that the early church used leavened bread. Eventually the Roman Catholic Church began to shift to unleavened bread. Letham connects this with the development of transubstantiation. Leavened bread would create crumbs, and they did not want the physical body of Jesus to fall on the ground. The Anglican Church is the only Protestant church to continue to use unleavened bread. All of the others used leavened bread like the Eastern Church has for over a thousand years. In his book Given for You, Keith Mathison, mentions a controversy involving Baptist theologian Stevens regarding the use of grape juice versus the use of wine in the Lord’s Supper. Stevens notes that this is similar to whether to use leavened or unleavened bread. Mathison rightly responds that leavened bread is still bread while grape juice isn’t wine (nor is wine simply juice). The Scriptures and our confessional documents simply say “bread” without any clarification or limitation. In light of the above reasons, we believe it is wise to affirm the view expressed by John Calvin. Our conclusion is that we will continue to use leavened bread but also make an unleavened, gluten-free option available for those whose conscience holds that it should be unleavened. Most Protestant churches used leavened bread while the Church of England continued to use unleavened bread. Argues that in places that don’t grow wheat or have bread, a common staple food can be used. This is not a question of novelty, introducing a new sign, but recognizing that bread would be novel for them. “The bread used by Jesus was doubtless the unleavened bread of the Passover meal, as the wine he used was doubtless the fermented juice of the grape. But this does not mean that we must uof necessity use unleavened bread, nor does it mean that we cannot use the unfermented joice of the grape. … To insist on literalism would be tantamount to legalism.” Quoting William Stevens, pp. 306. “Following this, the evidence (such as we have) indicates the church in the early centuries universally used ordinary leavened bread. By the eighth century, the bread and wine had officially begin. To be identified with the body and blood of Christ. Since leavened breat was mor likely to crumble and so fragment the body of Christ, Rome required the use of unleavened bread. However, the East refused to follow, accusing Rome of Judaizing tendencies, and to this day it continues to use ordinary leavened bread.” pp. 54. Sproul, Vol. 3, pp. 148. This was a huge discussion in the 900-1100s (or so) between the East and the West. But rather little reference is made to it here. Why are none of the apologists of the Azymes Conversersy quoted?